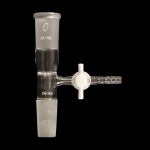 Borosilicate glass vertical vacuum take-off adapter with PTFE stopcock on a sidearm. 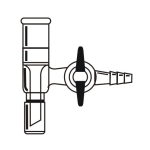 Adapter has a standard upper outer joint and lower inner joint with sealed-in drip tip. Serrated hose connection has an OD of 10mm.